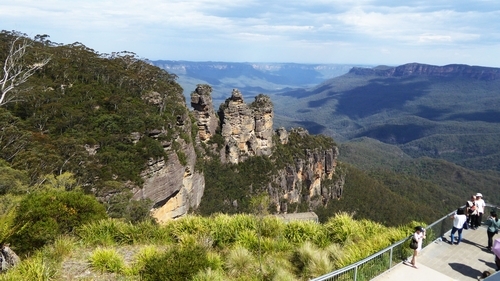 The spectacular scenery of the Blue Mountains World Heritage Area surrounds the historic town of Katoomba. Scenic and secluded, Katoomba offers a change of pace to life in the city - giving you an opportunity to relax, unwind and recharge. It also provides a base from which you can explore the rest of the Blue Mountains region. Visit the Echo Point Lookout to truly appreciate the beauty of this area with its famous blue haze that emits from the vast eucalypt forests. Don't miss out on the thrill of a skyway, cableway, or railway ride at Scenic World Blue Mountains for 360-degree views of the magnificent Jamison Valley. Savour uninterrupted views of iconic landmarks including the Three Sisters, Mount Solitary and Katoomba Falls aboard the Scenic Cableway or gaze down into the valley below through the electro-glass flooring of the Scenic Skyway. Make your way down to the forest floor with a ride on the world’s steepest passenger railway, the Scenic Railway, and find yourself at the starting point of the Scenic Walkway, a family friendly elevated boardwalk that weaves its way through spectacular Jurassic era rainforest. Plenty of easy walking trails begin at Katoomba, or you can join a bushwalk with a local guide. Check out the Round Walking Track, a short yet stunning walking track through a lush rainforest gully that leads to lookouts with some of the most iconic views in the Blue Mountains. If you happen to have more time on your hands, be rewarded with the views and experiences offered by the region’s longer treks. Pass by ethereal waterfalls and great photo opportunities along the Leura Cascades Fern Bower, make your way through the Jamison Valley along the challenging Federal Pass track or encounter rainforest, woodland and breathtaking views along the difficult Mount Solitary walking track. For an introduction to the rare plants and animals found only here, stop in at The Edge, a six-storey cinema screen that showcases the grandeur of the Blue Mountains. Or try a new adventure, such as abseiling, rock climbing or caving. Katoomba has been welcoming visitors for years, with a range of accommodation including heritage-listed guesthouses, B&Bs, eco-lodges and five-star hotels, offering spa facilities, great food and comfortable beds. It’s also home to a buzzing food scene, with stylish contemporary food is on the menu at cafes and restaurants, and you can buy artisan breads, cheese and chocolates from the many specialty shops in town.